One of the biggest reasons to why my wife and I wanted to start full-time RV living was so we could be closer to nature. We wanted to be able to wake up, put on some clothes, open our door and be right there in the woods. At the same time, the RV is our home, and we like to keep our home clean. When you’re so close to nature, it’s natural that you’ll go in and out more often, with this comes a lot of dust, gravel, and dirt. Most of this can be taken care of with a broom and a dustpan, but eventually, the RV needs to be vacuumed. As with most RVs, space is limited. Having a big upright vacuum cleaner is just not very practical. Fortunately, there are a lot of good stick vacuums cleaners on the market today, and that’s what today’s post is about. We’re going to find the best vacuums with the most suction, both corded and cordless, so we all can keep our RVs neat and tidy. The VonHau 2-in-1 is a neat little vacuum that would work great in an RV that doesn’t have much carpet. It’s lightweight and the fact that it’s a 2-in-1 means that you can take off the handheld part and also use it in cars, trucks, closets, etc. With 14 KPA of suction power, it will do a great job on the floor in RVs, and a somewhat good job on carpet. The long 19.5 ft power cord will let you move around the trailer with ease. Where the VonHaus 2-in-1 shines is with its huge dust bin. With a capacity of 1.3 liters, it’s the biggest dust bin I have ever seen on a bagless vacuum. This is convenient since you won’t have to empty it every time you vacuum and the fewer chores you have to do in an RV, the better. The size of this vacuum will also make it easy to store since you can take the stick off and store it alongside the handheld section. When the time comes to empty the vacuum, you can easily open it up and dump the content into a trash can. A washable HEPA filtration system will be easy to keep clean with some warm water and then put back into the vacuum. Included with the VonHaus 2 in 1 is a crevice tool for tight spots, a small brush attachment for when you’re using the vacuum in handheld mode, a hose adaptor, shoulder strap, and an extension tube. 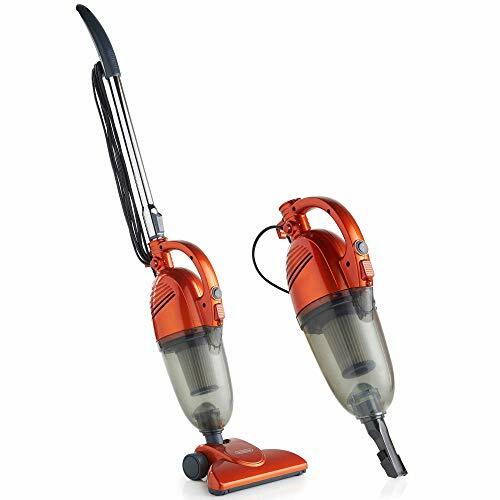 The features of this vacuum together with all the included accessories, make this a great vacuum at this price. A versatile vacuum is exactly what an RVer needs, and this one is powerful enough to do the job. Clean the floors with the full-length vacuum, and then remove the stick and clean the rest with the handheld section. If orange isn’t your favorite color, there’s also a gray version available. Next up, the Bissell PowerEdge. 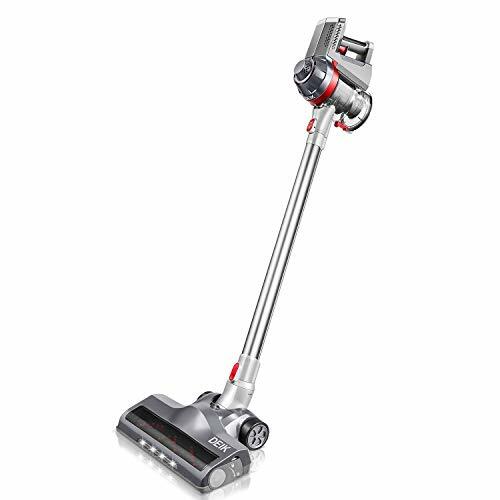 You can identify this vacuum by its somewhat unique V-shaped foot. It reminds me of an open crab claw. So what’s the thinking behind this? Well, the shape of it makes dirt and debris get directed to the middle part of the foot, which is where the suction happens. Small debris can be sucked up along the edges of the foot, but bigger dirt like cat litter and cereal will be brought to the middle and then taken care off. Another benefit of having a V-shaped foot is that it’s very easy to clean edges. There are tons of edges and corners in an RV, so with this, you’ll clean each edge and corner with ease. Rubber squeegees on the bottom of the foot will also make it great at picking up pet hair. The Bissell PowerEdge is a bagless vacuum, meaning that you don’t have to purchase bags that you fill and throw away every other month. With a bagless vacuum, all you have to do is take the dust bin off the vacuum and empty the debris into a trash can. It’s becoming a more and more popular way of dealing with debris in vacuums and I can only say good things about it. Less trash means better sustainability. The Bissell PowerEdge might not be as versatile as the other vacuums we’re looking at today, but it’s still a good choice for somebody that wants a corded vacuum to clean the RV. The V-shaped foot is genius for RVers since there are so many corners and edges in RVs. If you have pets and want a quick way to clean up the carpet and floors and don’t need to have a handheld section that you can take off, this could be the best choice for you. The Deik MT1206 is a cordless vacuum with 7KPa of suction power. Since it’s a cordless vacuum, you’ll have to get done cleaning before the battery life runs out, but with up to 25 minutes of fade-free suction that shouldn’t be a problem unless your RV is huge. Weighing in at only 4.7 lbs, it’s a very portable and easy to handle vacuum cleaner. That becomes even more clear when you realize it’s a 2-in-1 with a handheld section that you can easily take off the stick. This is great if you expect to clean furniture, closets, corners, and tight areas like a truck or car with this. Just like the other vacuum cleaners we’re looking at today, the Deik MT1206 is a bagless product. Meaning that when it’s time to empty the dust bin, all you have to do is push a button and empty the dust bin into the trash. Having to spend money on bags and packing them in and out of your vacuum is a thing of the past. Included with the vacuum is also a wall mount, so you can hang this in your closet and out of the way. Less organizing to do when your vacuum cleaner always has its own place in the closet. So is 7Kpa going to be enough suction power? Yes, it’s good suction, but you have to remember that this is a cordless vacuum so how long you can clean will all depend on the battery life. Batteries are known to decrease over time, so while it might have great suction when you purchase it, a year later the battery life could be at half capacity, and after two years you’ll be looking for a replacement. A Cordless vacuum is a new market that is quickly evolving, but take this into consideration when you’re shopping for a vacuum. With all of that said, take a look at the Tineco A11 below if you really want a good cordless vacuum. Note that the Deik MT1206 lights up areas where you’re cleaning to help you see all debris and dirt on the floor. Here’s a vacuum cleaner from a more known company, SharkNinja. 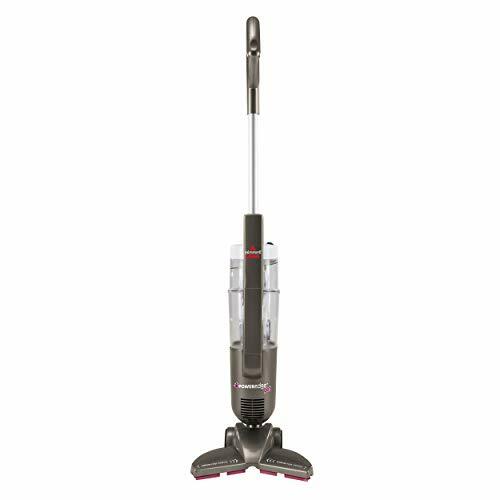 This is their Rocket DuoClean HV382 model, and if the name didn’t give it away, let me tell you that this is a great and advanced vacuum. It’s so great that I have picked this as the best corded vacuum for RVs available on the market today. Now, let me tell you why. First off, it’s a 2-in-1. A 2-in-1 is great for travelers because we want each of our tools and accessory in the trailer to be able to do just more than one thing. If a tool can only do one thing, it’s a waste of storage. 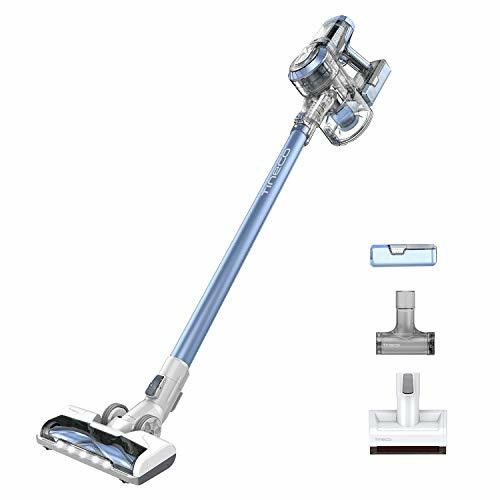 A 2-in-1 vacuum means that you can use it as a full-length stick vacuum, and then take off the handheld section, sometimes found on the top and sometimes on the bottom of the vacuum, and use it as a handheld vacuum. So when is this useful? When you want to clean closets, your truck, corners, furniture, even tables. Second, this is a corded vacuum. Now, some people want a cordless vacuum in their RV because they don’t always have access to electricity and they don’t want to deal with a cable, I get that. The thing is that if you want to buy a vacuum like this with the same amount of features, suction power, and versatility, you’ll have to pay double. Maybe you could put that money towards a generator instead and all of sudden you can vacuum whenever you have gas in your generator. Why I believe a corded vacuum is beneficial in the RV, is that not only do you have to not think about how much battery life you’ve left, but the suction power is there whenever you need it, and we all know that we get more and heavier dirt and dust in an RV compared to a home. More debris and dust requires more suction power because we don’t want to have to go over the same spot 4 times to pick up the dirt. Third, the accessories included with this vacuum. We get a pet multi-tool brush that works great on carpet, a crevice tool for tight spots and a wall mount storage hook. Hang it in your closet while you’re not using it, or take it apart and store the stick alongside the handheld section. The power cord included with the DuoClean HV382 is 30 ft long. When the time comes to empty the 1 L dust bin, all you have to do is hold the handheld section over your trash and click a button to let the dirt out. To sum it up, the versatility, the accessories, the easy-to-empty dust bin, and the long power cord make this my favorite corded vacuum cleaner for RVers. The DuoClean HV382 also has led lights on the foot to brighten up areas you’re cleaning, this is a great feature to avoid leaving dirt behind. Tineco might not be brand you recognize, but they’re not a new brand at all. They’ve been making vacuum cleaners for over 20 years and made some less-known but impressive vacuum cleaners. In fact, I like the A11 Hero and its features so much that I rank it higher than the Dyson cordless vacuums, and I will tell you why. It’s a 2-in-1 vacuum so you’ll always have the option to turn it into a handheld vacuum when needed. Just remove the stick and put whatever tool you would like directly on the vacuum. What Tineco has done right is with the batteries. They use the same lithium-ion batteries that Dyson does, but this vacuum comes with two batteries and you can charge both of them individually. What this means is that compared to the Dyson, the A11 Hero has removable batteries. So what I said earlier about batteries losing capacity after a year or two and ending up with a useless cordless vacuum does not apply to the A11 Hero in the sense that you could recycle your old batteries and buy new ones when they’ve gone bad. Dyson does not give you this choice. If the battery in a Dyson cordless vacuum goes bad, you’ll have to buy a new vacuum at full price. If there’s one thing I wish Dyson would change, it’s this. The two batteries will let you vacuum for up to 60 minutes, 15 minutes in max mode. Included with the package are a dusting brush, a crevice tool, a full size LED power brush, a mini power brush that works great on pet hair, two batteries, and a charging station for those batteries. The A11 Hero has a dust bin capacity of 0.6 liters which isn’t the biggest dust bin we’ve seen, but since it’s so easy to empty I don’t see it as too much of a problem or inconvenience. When the dust bin is full all you have to do is hold the handheld section over the trash and push a button. This opens the dustbin and dirt will fall into the trash. As with the other bagless options, you can take the dustbin apart and wash it with warm water to clean it. Another thing that makes the A11 Hero stick out a bit from the others is when you take a look at the filter in the dustbin. Tineco has created a rinse-free filter cleaning tool so you don’t have to get down and dirty with the filter under warm water. Last but not least, the Tineco has led lights that brighten up where you’re vacuuming to easier see dirt and debris that needs to be taken care of. So how come I put the Tineco A11 Hero above the Dyson? I have two reasons. First, the batteries are removable. You shouldn’t have to throw away your whole vacuum when a battery has gone bad. Second, a small detail but the lights on the full-size power brush are great to have. Especially in RVs where small spaces usually aren’t very well lit. I bet this is a small detail we’ll see on future Dyson vacuums. Last but not least, the Dyson Cyclone V10 Absolute. It deserves the name, because it’s an absolute powerhouse of a vacuum. 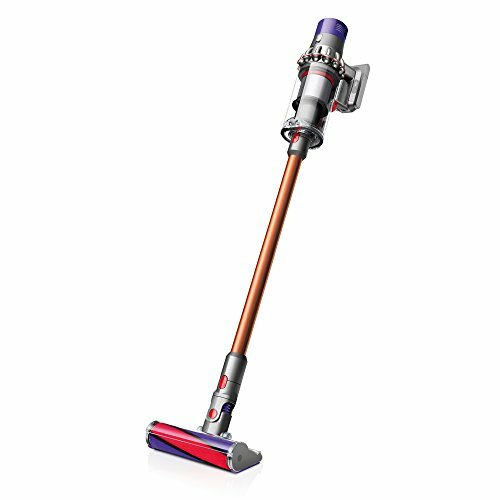 Great battery life, and impressive suction, in a 2-in-1 vacuum. It only falls short in a few aspects, which is why it’s not my top-pick, more on that later. The V10 Absolute will let you vacuum for up to 60 minutes unless you’re using one of the motorized tools. Speaking of tools, in addition to the non-motorized crevice tool and mini soft dusting brush, you’ll get a mini-motorized tool and a combination tool. Using the combination tool will bring down the battery life to 20 minutes, which is more than enough for some. Using the soft roller head will limit you to 40 minutes of vacuuming. I mentioned that it’s a 2-in-1 vacuum, so whenever you get to a spot like a closet or want to clean your truck, you can detach the stick and use it in handheld mode. A 2-in-1 is great to have as an RVer, since there are some spots that aren’t very practical to clean with a full-sized stick vacuum. Dyson’s vacuums are very popular, and their cordless vacuums are no exception, so why is that? They are ahead when it comes to suction power in my opinion. You can clean carpet extremely well with a Dyson cordless vacuum, which means that it will do an even better job on hard floors. The bin size on the V10 Absolute is 0.77 liters, which is slightly above average and a good thing. Having to empty the vacuum less is more convenient. When you do have to empty the bin, all you have got to do is hold the handheld section over a trash can and push a button. Dirt and debris will fall out and you’re done. My biggest critique when it comes to Dyson’s cordless vacuums is the fact that the batteries are non-removable. Batteries that constantly recharge loses capacity, and if your battery has lost 80% of its capacity in three years, you’ll have to go buy a new vacuum if you have a Dyson. I get that they want you to go spend the money on a new vacuum, but I can’t recommend a vacuum without removable batteries when there are other options with similar features that have removable batteries. I really hope we’ll see a Dyson cordless vacuum soon with a removable battery so customers can recycle their old batteries and buy new ones when the capacity has dropped. After looking at a bunch of vacuums today, I have found my winners. I have chosen two, one corded and one cordless that I believe are the best vacuums available on the market today for RVers. When it comes to the cordless category, it’s a close one, but I am confident with my choice and my reasoning. Corded: SharkNinja Rocket DuoClean HV382 – The Rocket DuoClean HV382 made by SharkNinja is my winner when it comes to corded vacuums. With lots of features and accessories, it will do a great job in the RV. Cordless: Tineco A11 Hero – The Tineco A11 Hero is the hero of cordless vacuums. Removable batteries, 2-in-1, several accessories and tools, and a LED light to lead you to the dirt. If you like technology, this is the vacuum for your RV. Corded Vs. Cordless – First thing to consider is whether you need a corded or cordless vacuum. I know that a cordless vacuum sounds awesome and more convenient to use, but it has its limitations with battery life being the biggest one. A vacuum that you’ll have to place near an outlet and charge up suddenly doesn’t sound as convenient. But then there are the limitations a corded one has, you’re going to need an outlet. If you’re the kind of camper that likes to boondock, you’ll need an inverter or a generator to be able to use a corded vacuum cleaner. 2-in-1 – Are you going to need a vacuum for more than your RV floors? Like your truck, or closets? A 2-in-1 vacuum is extremely versatile due to the fact that you decide what and how you want to use it. With most vacuums including several accessories, you’ll have a lot of choices where one tool might work better on a hairy couch than a different tool. A 2-in-1 vacuum with the right tools can be a godsend when it comes to cleaning the inside of an RV. But if all you’re going to clean is your floors, there’s no need to splurge more for a 2-in-1. Battery Life – If you do decide to go for a cordless vacuum, battery life is the biggest factor. You probably won’t need than 15 minutes to clean a small RV, but if you have a big RV and a big truck that needs to get clean, you might need at least 30 minutes. Storage – Where are you going to store your vacuum, and would you prefer if you could take it apart and put it in a box? Some products let you do this, while some don’t. Some vacuums come with wall mounts so you can hang it in a closet while not in use. Weight – Another reason why 2-in-1 vacuums are great is due to how lightweight they often become when you take off the handheld section. A light vacuum can be held over your head so you can clean ceilings and shelves. If the vacuum is just one big piece it won’t be as easy to lift it off the floor. How does a bagless vacuum work? A bagless vacuum still takes care of your dirt, but instead of going into a bag, it goes into a bin. A bin that is easy to access so you can empty your dirt, and easy to clean so you can keep the suction power the vacuum is capable off. What is a 2-in-1 vacuum cleaner? A 2-in-1 vacuum cleaner means that it’s a stick vacuum with a handheld section that comes off. This is great if you’re not only cleaning floors but want to be able to stick the vacuum in your closets, under counters, your truck or in furniture. A 2-in-1 vacuum often has parts that are easy to pick apart so you can within seconds change out a tool for another etc. It also makes it easier to store since you can take parts off and store on top of each other, compared to a stick vacuum that is a fixed length and is bulkier to store. Why does it matter if a battery is removable? If you can’t remove the battery, what happens to a vacuum cleaner when the battery capacity has dropped to half after a year or two? It probably goes in the trash. Do you want to buy a new vacuum cleaner every two years, or just buy a new battery for it and have it perform as new? Being able to buy a new battery and recycle the old one will not only be better for your wallet but also the environment. The more parts that the user can replace on their own when they underperform, the better.